What Are Pharmaton Complex Multivitamins? Pharmaton complex is a multivitamin with minerals and ginseng extract G115 recommended for relief of daily fatigue. It contains a balanced combination of G115 concentrated ginseng extract, vitamins and minerals. 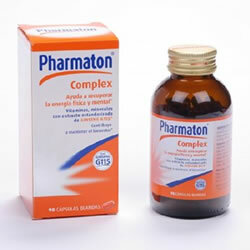 Pharmaton complex help during periods of exhaustion through stress, tiredness, or weakness and when you experience a lack of vitality Pharmaton also help prevent and treat symptoms caused by ill balanced or deficient nutrition. What Are The Benefits of Pharmaton Complex with Deanol? It helps improve cognitive functions in the elderly. It helps protect brain cells from oxidation. It helps improve concentration and memory. It helps improve all intellectual and mental processes. It helps improve intelligence and physical energy. It help preventing aging or liver spots. It helps increase circulation to the brain and improve brain health. It helps improve red blood cell function. It helps improve muscle reflexes. It helps improve oxygen efficiency. It helps extending life span. What is the difference between Pharmaton Vitamins and Pharmaton Complex? Both contain the same ingredients but Pharmaton Complex contains an extra ingredient which is Deanol. In recent years, Deanol has been recognized as an important supplement because it is a natural source of choline and a precursor of acetylcholine. Taking a supplement such as Deanol may increase the levels of certain neurotransmitters in the brain that produce a range of cognitive benefits such as improved memory and concentration and mental functions. What are the benefits of Deanol? It is an amino acid that occurs naturally in the human brain. Deanol is an organic compound found in different types of fish and other foods. Where is Pharmaton Complex Vitamins Made? Pharmaton complex is an exclusive Swiss formula with a proper balance of vitamins and minerals needed by the body. It conatains unique ingredients such as Deanol, vitamins, minerals and Ginseng Extract G115 which help protect cells against natural wear caused by stress. What are Pharmaton Complex Vitamins Benefits? Pharmaton complex helps you to effectively carry oxygen in your blood, which can increase energy production for better physical performance and cell protection. Every day your cells are subjected to various harmful agents besides the product wear rate of modern life, this includes stress: if you add the number of daily activities you do, poor diet, impaired cells is greater and when the capacity ratio is exceeded, your cells die. This cellular damage is one of the responsible for aging, since all our body is made up of cells. Pharmaton vitamins formula helps protect cells and thus make better use of your energy, and to get better physical performance. For all this you get more vitality to improve stress management in daily life and cell protection. Vitamin A (2667 UI).......1.16 mg.
Vitamin D3 (200 UI).......0.005 mg.
What is Ginseng Extract G115? The G115 is a ginseng extract with clinically proven studies worldwide. The standardized ginseng G115 is Pharmaton exclusive ginseng extract. G115 is obtained from the root of Panax Ginseng, originally from South Korea and China, It has advantages as it is considered of good quality and rich in active ingredients which makes Pharmaton vitamins the big difference. It involves the standardization, that is the process whereby the Ginseng extract G115 is obtained with techniques that under a number of lineaments and rules ensures it's quality: in each capsule, the contents of the active ingredients is exactly the same. We have the support of Pharmaton Vitamins worldwide clinical research. Intensive analytical-, preclinical- and clinical- research has been carried out during the last 30 years to study the quality, efficacy and safety of the standardised Ginseng extract G115®. 54 preclinical studies have been published on G115® and 46 clinical studies have been published about Pharmaton. How Does Pharmaton Complex with Ginseng Extract G115 Work? The standardised Ginseng extract G115® influences positively the body resistance against infections, stress and fatigue, mainly as a consequence of an increased immune response, enhanced utilization of the energy in brain and muscles, and body cells protection against free radicals damages. Several species and qualities of Ginseng exist. The manufacturing method of the standardised Ginseng extract G115® is proprietary of Pharmaton and grants that every batch of capsules of Pharmaton has the same level of active principles. The pharmacological, clinical effects and the safety of the standardised Ginseng extract G115® can not be extrapolated to other Ginseng extracts or Ginseng products. What Are Pharmaton Complex Effects? Ginseng G115® influences your body’s use of energy – thus reducing daily fatigue – mainly as a consequence of the increased capacity for oxygen uptake. The ginseng extract also acts on the central nervous system and helps minimize stress, physical and mental tension. Furthermore, Ginseng G115® positively influences and strengthens the immune system. What are The Main Benefits of Taking Pharmaton Complex Vitamins? It has an optimally balanced formulation. Pharmaton combines vitamins, minerals, trace elements and ginseng in proportions that improve well-being and restore vital energy. The unique standardized G115® Ginseng extract contained is of very high quality and purity. For Pharmaton complex many clinical trials have been conducted and all indicate that the product is helpful in enhancing cognitive function and improving psychological conditions and physical performance. A recent clinical trial has shown that the combination of vitamins, minerals and trace elements and the standardised G115 Ginseng extract contained in Pharmaton improves quality of life more effectively than the same combination without Ginseng. The safety of Pharmaton complex has been demonstrated conclusively in several clinical trials, and has been confirmed by the extensive use of the product in the last few decades. A recent observational study has shown that Pharmaton is almost devoid of side effects and does not influence blood pressure parameters, nor does it cause any weight gain effects. Pharmaton complex combats symptoms caused by fatigue, tiredness, exhaustion, aging and convalescence associated with decreased mental capacity, alertness, concentration and memory.